Whether it’s to calm nerves or ensure passengers have an extra good time is not specified, but British Airways is introducing its own brand of gin for premium customers. 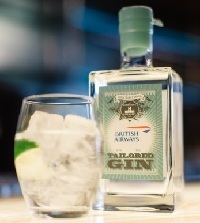 As of last Wednesday, the specially-made tipple – imaginatively named British Airways Gin and stocked in the bar at the prestigious Concorde Room in LHR T5 – is being served to the airline’s First customers. The gin was blended for BA by Cambridge Distillery after taste tests with First customers at the Concorde Room bar in London. Enthusiasts would probably like to know the main botanicals used, aside from juniper, are basil, rosemary and thyme, which are all grown in the distillery gardens. We were going to say it’s just the tonic, but the wordsmiths in BA beat us to it. However, a G&T is one of the most popular drinks served on BA flights, with more than 3m consumed every year. Will the new gin be known as "The BA BAG?"